I didn't have time to make a post last week and I am not sure if I will have time during the rest of the month. It depends on how my cookie baking goes! I am getting to be bit of a broken record but I didn't receive many lessons to review. I did get three lessons which I will review as soon as I finish this blog. I've had several students ask if they can continue after a year has past. YES! Just contact me for the updated materials. This week's tip is about the knitted cast on. This is one of the easiest cast ons to learn. I used this cast on for years until someone showed me the Long Tail method. The reason it is so easy is that it is similar to knitting. The problem with this cast on is that is it quite loose. It doesn't provide much support for the fabric which follows and it isn't very attractive. It is a good choice for lace as it is so loose and its appearance isn't all that noticeable at the bottom of lace. I've included it in my blog as I used it for the striped dress in the Spring issue of Cast On. This dress is a top down raglan and you need to add stitches at the underarm. The cable cast on is too tight and bulky. I find the "E" or Backwards "E" too loose. To work this cast on, you just place a slip knot on the needle. 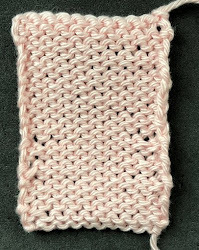 You then knit into this slip knot and place the loop back on the left needle. Notice that the edge is a bumpy edge. It is the same on the RS and WS. Here is what it looks like when a few rows are worked. You can see it is quite loopy. After the holidays I will do a tip on another type of cast on which is good for lace. I've used it a few times. I will also try to remember to video the process of weaving in the yarn tails at the thumb of one of the mitts. I had a suggestion to do this a few years ago (Thanks Maris) but I didn't want to knit a mitten just to do the video. Now that I have all of these mitts to finish I will give it a shot! There will not be a salon this week as I am going to Vegas where I plan to win big. I have a house sitter to take in any lessons which may arrive. My holiday knitting is going well. I steamed the hat for Isabel so Jan can send it off to France with the matching scarf she is making. We had the selection meeting for the Summer issue on Wednesday (to find out more about that, check my blog here TKGA website later in the month). Anyway, I wanted to do something special for Sadie, Jane and Marijane who are involved in the selection process. I had designed a pair of mitts as the pattern to be sent to new TKGA members and I thought it would be fun to give them all a pair. I can now do these in my sleep! That black blob to the extreme right is George's paw. I cropped him out. He feels it is his duty to inspect things I knit. Since I had yarn left over from the shawl I made for Stephanie, I decided to make a hat as well. I used the same sawtooth edging. I finished the mitts for Martha's sister-in-law. I really do have this pattern memorized! I decided to make a scarf for Cara as well. I love this yarn. It is so soft and the stitch definition is beautiful. I have a few more things to do before beginning the garments for the Summer issue.